I’ll be brief because honestly, I’ve got better things to do. A few days ago, I received an email via the organisers of a talk I’m giving in Canberra in a few weeks’ time. I’ve decided to publish it here with comments correcting the person’s accusations as I was frankly gobsmacked at their lack of ability to research some very simple claims. Backgound: The email is from Judy Wilyman who is a PhD student who is being supervised at the University of Wollongong (UoW) in NSW by Dr Prof Brian Martin (yes, THAT Brian Martin). Ms Wilyman began her PhD at UoW in 2007, then in 2008-2010 she transferred supervision to Murdoch University, WA, where she was supervised by Dr Peter Dingle (who no longer works there, and yes, THAT Peter Dingle). She transferred back to UoW in 2011, to Dr Prof Martin again, where she is completing a project entitled “A critical analysis of the Australian government’s rationale for its vaccination policy”. Phew, so far that’s a long PhD! 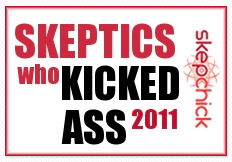 It seems she objects to me giving a talk to the Canberra Skeptics on February 15th. I won’t copy paste the entire email, for clarity I’m going to address each claim separately, but there is a copy in full here. Firstly, she got the date wrong (15.1.12). I’m speaking on 15.2.12. I like to think I only publish accurate information, so I always check references and sources to the best of my ability before publishing. It would have made it easier for me if Ms Wilyman indicated which information on my site was wrong, because I can’t find any. Note that she says “regularly” which leads me to think she doesn’t agree with much of what I post here. She also mentions other websites, and perhaps she means the piece I wrote some months back for Mamamia. There was a healthy debate about the info I posted there, mostly from people who don’t agree with vaccination full stop, but the information was very well received. I would have thought if it was an example of my “regular misinformation”, I would have been thoroughly corrected by the health professionals who applauded me for the piece and passed it on to their patients and colleagues. “She recently received a letter from Murdoch University asking her to remove a poster (presented by myself at the National Health Promotion Conference in Perth in 2009)which she had inaccurately presented on this website”. Not exactly. I received an email following a very polite phone call from IP lawyer Madeleen Rousseau from Freehills in WA on January 20th, 2012. To say she sounded exasperated on the phone is an understatement. You see it appears she has been given the job of chasing down where Ms Wilyman has misused the Murdoch logo on said poster and without permission. Her job is to try to remove all traces of it from the Internet. I removed the poster from the above link, sent a confirmation email to Ms Rousseau, she responded with a thank you, that was it. 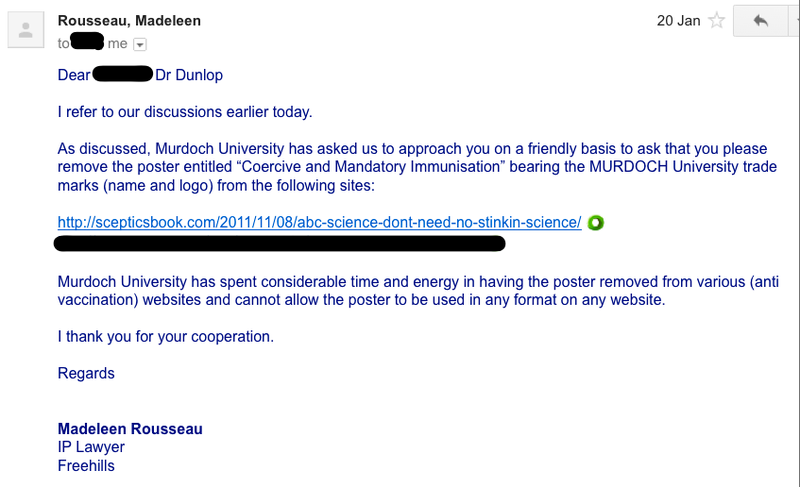 Notice she says in her correspondence, “Murdoch…has spent considerable time and energy in having the poster removed from various (anti vaccination) websites and cannot allow the poster to be used in any format on any website”. She was polite, I co-operated, there were no stand-over lawyer tactics or threatening letters. As for Judy’s allegation that I had somehow “..inaccurately presented (the poster) on this website..” I’m not entirely sure what she means by this. On the contrary, it appears that Judy has misused the Murdoch logo which is why their IP lawyers are trawling the Internet and attempting to erase the poster from history. Next she says I was asked to remove derogatory comments about academics. There was no such request in the email I have published in full above. I don’t ever recall being asked this. This is a fabrication as far as I can tell. 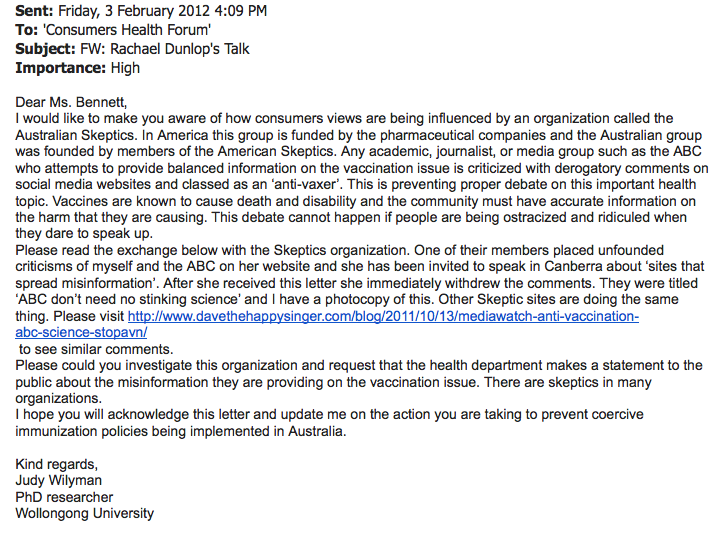 Next she says I left derogatory comments about her on my site, incorrectly referring to her as anti-vaccine. I did indeed call her anti-vaccine and for good reason. Let’s see why. Ms Wilyman has pieces published on well recognised anti-vaccine sites including Whale.to, SaneVax, the AVN blog (whose website was called anti-vaccine by the HCCC), she has given lectures with Meryl Dorey, President of the AVN in Western Australia. Even by this short account (and there is much more I don’t have time to cover), Ms Wilyman is anti-vaccine. See Dave The Happy Singer here and here for further information. Ms Wilyman, you can claim you’re not anti-vaccine all you like, but your writings contain well known anti-vaccine canards and are published on high profile anti-vaccine websites. If you can show me evidence to the contrary I will look at it and remove my classification of you as anti-vaccine if I am satisfied you have changed your stance. At the moment, I’m not. Update: Whilst Judy Wilyman claims not to be anti-vaccine, this recording suggests otherwise. Next “and her derogatory remarks about the ABC’s policies are offensive to the community who would like an academic debate on this important topic”. The community wants a debate on the ABC’s policies? That’s a first to me. Firstly, she hasn’t cited the apparent misinformation I am spreading and secondly my talk is about health information on the Internet with vaccination as an example. This does not mean the entire talk will be about vaccination. And is she saying that conspiracies and chemtrails are not misinformation? Curious. No, you’re not an “independent researcher”, you’re a PhD student. And why do I need to contact you to find out your views about vaccines? They’re pasted everywhere on the internet on lots of anti-vax sites. 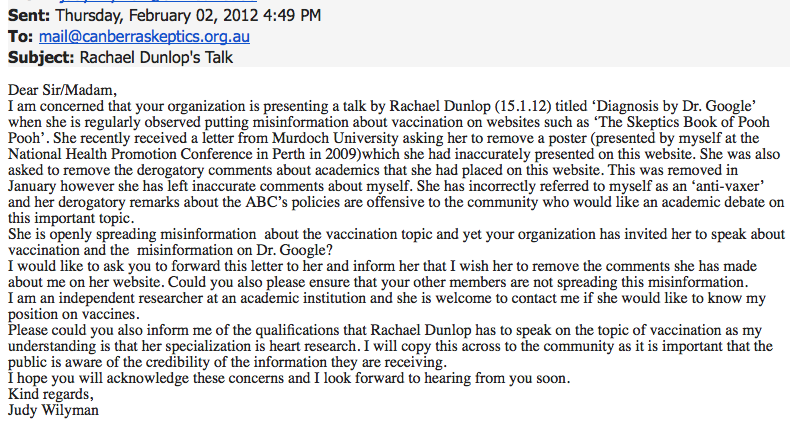 “Please could you also inform me of the qualifications that Rachael Dunlop has to speak on the topic of vaccination as my understanding is that her specialization is heart research”. My qualifications are easy to find Ms Wilyman. And if you are, as you claim an independent researcher you could have done some, you know research, and found out that my specialty is not heart disease. Are you really too lazy to look further than the name of my employer (The Heart Research Institute)? This shows your complete lack of research ability. You see there are lots of research groups under the roof of HRI. Some work directly in heart disease, some work on diabetes, some work on nutrition. Me? I’m a cell biologist who happens to work on ageing and MND. You could have found that it you went to PubMed. Or even Google (chortle). Or even my Twitter bio. Fail. As for my qualifications? You know she just might have me on this one. Given that the theme of my talk is Dr Google I can think on someone who is better qualified than me to talk about this issue, Wilyman’s mate Meryl Dorey. She’s had more than 20 years of education on Dr Google. But there’s one thing that I have that Ms Dorey doesn’t have and that’s the ability to critically analyse information, whether it be a scientific study or a news article or a website. You see, I have a PhD already (sorry to rub it in Judy) and more than 6 years of research experience which includes writing, reviewing and critically analysing scientific information. So my BS meter is pretty finely tuned. Thus, I can confidently say I’m more than qualified to sift between fact and fiction on the Internet. And given that I’ve been studying the tactics of the anti-vax movement for more than 3 years, this is a bonus. One might say, a desirable but not essential qualification. Finally. “I will copy this across to the community as it is important that the public is aware of the credibility of the information they are receiving”. And I will also copy this critique of your lack of ability to do your research across the community. You’re welcome and thanks for trying. Another update: Judy Wilyman has again written to Canberra Skeptics and the email has been published on Meryl Dorey’s blog. You can see the text in full on Reasonable Hank’s blog here. Contains the text that because I’m on the editorial board of a CAM journal I’m somehow a Big Pharma Shill. It’s worth a look. You will LOL.